Bluejacket Workshop is housed in the larger Scaldbeck Cottage Workshop and was built by Ned and his son Nick Hamond in 2002, on the same site as Ned’s father’s workshop. The Hamonds have lived in Morston since 1914, and been in North Norfolk since c1500. The name Bluejacket is inspired by the billyboy ketch (a type of vessel ideal for shallow creeks) that traded out of Blakeney Harbour from 1867 to 1911. The Bluejacket was well known locally, and Major Philip Hamond bought it to convert into a houseboat for his family. It was anchored to the west of Morston Creek where it remained until finally disintegrating in 1938. The vessel was built in 1860 and measured 61.5ft overall 16.5ft beam and 7.8ft depth (sourced from: The Chatham Directory of Inshore Craft – Traditional Working Vessels of the British Isles). 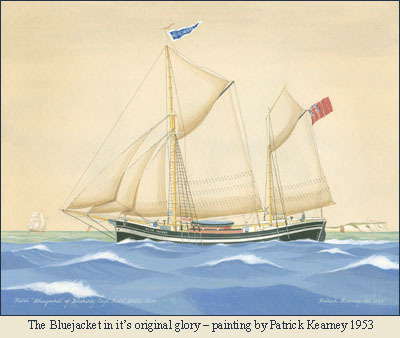 The Bluejacket print by Patrick Kearney is available to buy at www.patrickkearney.co.uk.